Every year, USGBC names the top U.S. states leading the nation in sustainable building through LEED. The 2015 Top 10 States list honors transformative efforts at the state level to create healthier, more energy- and water-efficient places to live, learn, work and play. In 2015 alone, 1,633 projects were certified in the United States—equivalent to an incredible 275 million square feet. In this series, we spotlight the standout LEED-certified projects of 2015 that contributed to the overall Top 10 rankings, celebrating some of the best examples of green building design, construction and operation. 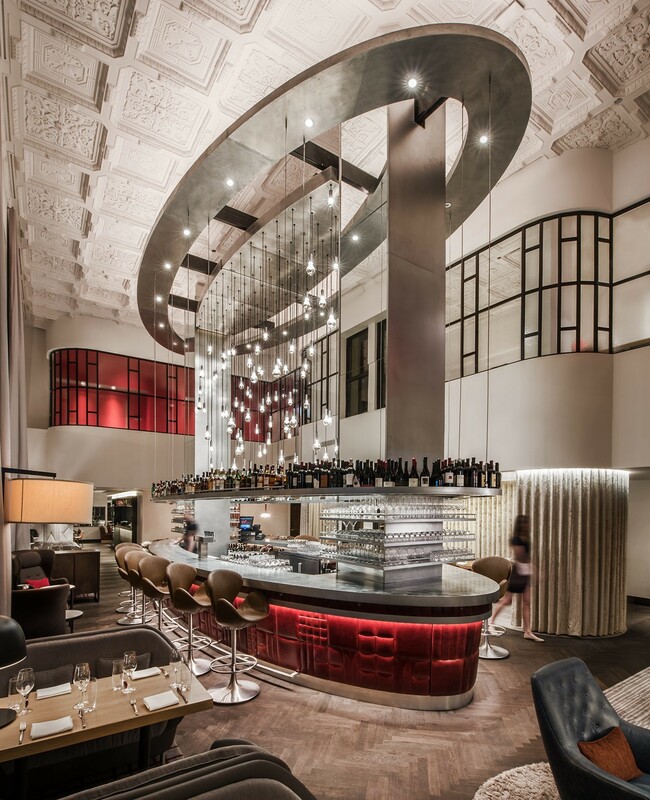 Virgin Hotel Chicago, the brand’s first property, opened in January 2015 and was certified LEED Gold on July 31, 2015. The hotel occupies the former Old Dearborn Bank Building located at 203 N. Wabash Avenue, which was built in 1928 and designated as a Chicago landmark in 2003. VHNA Acquisition, LP, the project developer, pledged to preserve the Art Deco building’s integrity early on. Through an extensive renovation and restoration process, VHNA Acquisition, LP brought the property into the modern era using LEED, while still respecting the building’s legacy. The hotel features 250 rooms and suites, two restaurants, a rooftop bar and lounge, spa, meeting rooms and function spaces, and the Virgin Hotels Commons Club—the hotel’s central lounge and restaurant. Modern sustainability upgrades include a green roof and energy- and water-conserving installations such as high-performance windows, smart thermostats, occupancy and light sensors, water-efficient fixtures and toilets and high-insulation walls and roofing. Virgin Hotels also gives guests the option to help offset their carbon footprint during their stay by donating 75 cents per night. The project scored high points on the LEED Scorecard, thanks to its proximity to public transportation and development in a dense urban area, maximization of open space, efforts to source regional materials and management of construction waste, among other features. Overall, LEED helped the project achieve a 30 percent improvement over the baseline building energy standard and eliminated the use of potable landscape water. "Our goal as a company is to have all our properties achieve LEED Silver, so we are ecstatic to have exceeded that benchmark in Chicago," said Raul Leal, CEO of Virgin Hotels. "As we continue to open additional properties, we have aspirational goals of moving towards a net zero carbon footprint across the board." For the third year in a row, Illinois set the bar high for green building in the United States, ranking No. 1 on the Top 10 States list, with 43.98 million LEED-certified square feet in 2015. It’s no wonder that the state’s appetite for green buildings continues to grow—Chicago has the most square footage of LEED-certified space of any city in the world. USGBC’s Green Economic Impact Study, conducted by Booz Allen Hamilton, estimates green construction in Illinois will contribute $37.8 billion to the state’s GDP, including $25.11 billion in labor earnings and 440,000 jobs between 2015 and 2018. Unsurprisingly, LEED is driving this growth. LEED projects alone are expected to add $36.13 billion to the Illinois GDP, with 413,000 jobs and $24.22 billion in labor earnings, as well as $567.9 million in tax revenue by 2018. Other noteworthy projects that were LEED-certified in Illinois in 2015 include the LEED Platinum Method Products PBC manufacturing facility in Chicago and the Knoch Knolls Nature Center in Naperville, a LEED Platinum visitor and exhibition space dedicated to education.